Did you guys do anything fun for Halloween? My Halloween night consisted of a ham, egg, and cheese crepe for dinner with a glass of Chianti, and then I fell asleep watching the World Series, and it was fabulous. Anyway, this afternoon I decided to get into the kitchen and whip up a batch of healthy Chocolate Chip Peanut Butter Protein Bites! I had most of the ingredients on hand and this was a super easy recipe to pull together. I started by toasting the coconut, which was the only baking required! 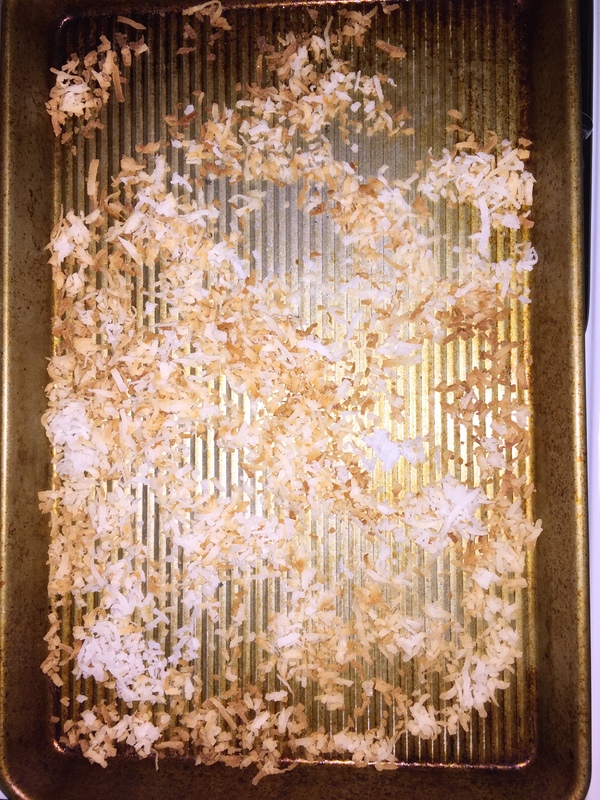 Just spread the coconut out on a cookie sheet and bake at 350 degrees for about 7 minutes. It smells and tastes so delicious. As the coconut was toasting, I gathered my remaining ingredients: old-fashioned oats, honey, vanilla extract, ground flaxseed meal, creamy peanut butter, and chocolate chips. Since these are no-bake bites, the ground flaxseed is used here to replace the eggs, and is essentially works as a (healthy) binding agent. Once I had all the ingredients incorporated, I placed the mixture in the fridge to chill. I let it go for about an hour while I watched 30 Rock reruns on Netflix. You can speed this up by placing everything in the freezer. You just want the dough to chill enough so it’s easier to roll into balls. Once ready, form 1″ balls and store in the fridge in an airtight container. Enjoy! These bites are so tasty, a great snack to have on hand for the week. How festive did you get this weekend? Those look amazing!!!! I love anything with PB, but would probably leave out the coconut since I’m not a huge fan.